Zoomorfo B, featuring the famous face of Cauac Sky, Quirigiua’s most prolific rulerQuiriguá was built on the eastern extremes of the Mayan region to control the trade passing up and down the Motagua River, which stretches all the way to western Guatemala and the Pacific coast. The site was occupied from around 200AD, but was of little importance until Copán refounded the settlement in the early 5th Century. 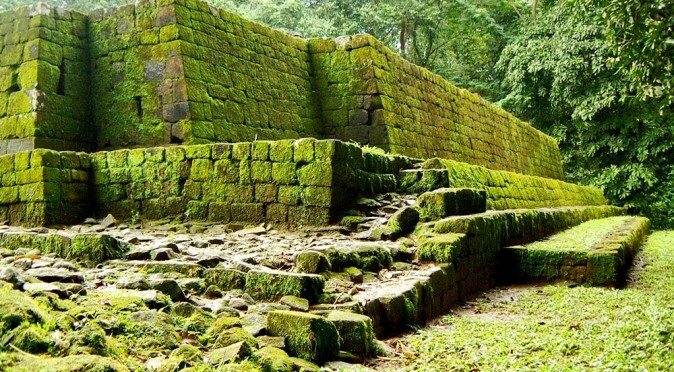 The first ruler of the new settlement is recorded as Tok Casper, who was installed in 426AD by K’inich Yax K’uk’ Mo’, ruler of Copán. Remarkably, K’inich Yax K’uk’ Mo’ had himself only been installed as the new ruler of Copán three days prior, on the 5th September 426AD. He had been installed by Tikal in a similar act of refounding an already occupied settlement. Therefore it is most probable that Tikal wanted to take control of an existing trade route running along the Motagua River and did so by installing a new wealthy elite and a promise of riches and better living for the locals, rather than through blood-shed and war. The river ran through Quiriguá at the time and provided an easy way to transport goods between the east and west of the southern Maya region. Of particular importance was the lucrative jade trade of Motagua Valley and the mines that operated at the western end of the river. Through the two southern cities of Copán and Quiriguá, Tikal was able to extend far beyond the previous southern limits of the Mayan trade network, opening up vast economic possibilities that fed these two new vassal city states enabling them to quickly grow. This whole expansion may have in turn been masterminded by Teotihuacan who appear to have held influence over Tikal at around this time and were renowned for their trading empire. 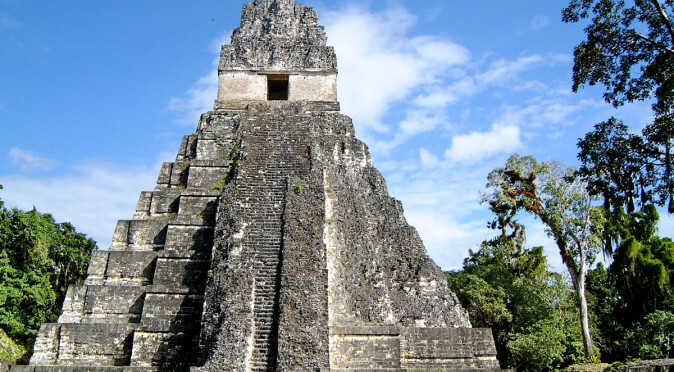 Evidence of Tikal’s influence may be found in the hiatus that occurred at Quiriguá between 495AD and 653AD, which resulted in no new monuments being erected. This roughly coincides with the difficulties Tikal was experiencing whilst locked in battle with their arch-enemy and fellow Mayan superpower, Calakmul. To compound Quiriguá’s misery, the city was hit at the turn of the 7th century by a terrific flood which resulted in the city being lost beneath heavy silt. Only a few buildings survived, including those of Group A, which were saved by their hill-top location. 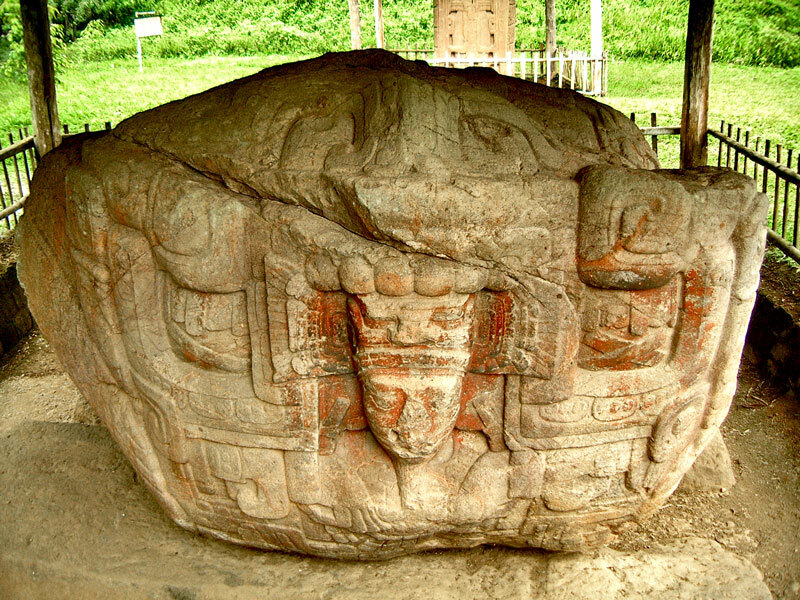 The end of the hiatus is signalled by the creation of Altar L in 653AD, which notes the continued relationship between the new king of Quiriguá, K’awiil Yopaat, and Chan Imix K’awiil of Copán. Steadily, major building projects also began as the city resurrected itself from the silt and got back to business as usual under the guidance of Copán. 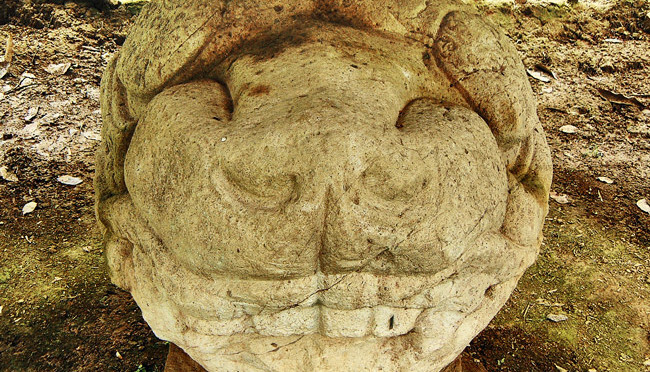 Through most of its history, Quiriguá had been little more than a trading outpost for Copán and Tikal. Things looked set to stay that way post-hiatus when Copán’s ruler, Uaxaclajuun Ub’aah K’awiil, appointed Quiriguá’s latest ruler in 724AD. Fig. W0981: Altar M, categorised as Monument 13 However, after little more than 10 years in charge, the new ruler, K’ak’ Tiliw Chan Yopaat (also known as Cauac Sky), began to view himself as more than a subordinate to Copán. 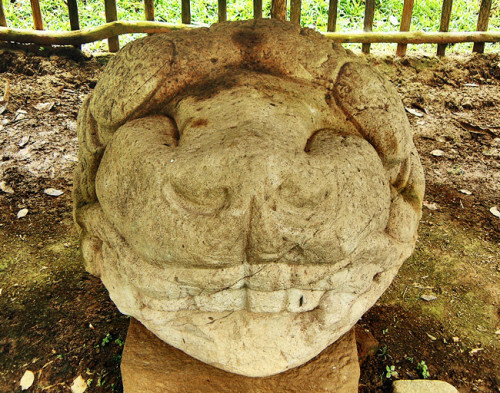 In 734AD he dedicated a monument known as Altar M with a hieroglyphic text that includes the first use of an emblem glyph for Quiriguá – this shows that the city was starting to think of itself as independent. It is also thought that the text refers to Cauac Sky as the Holy Lord or k’uhul ajaw of Quiriguá, a title that would not be used by an vassal lord of an inferior city. These seeds of independence were duly reaped on the 27th April 738AD when Cauac Sky captured king Uaxaclajuun Ub’aah K’awiil of Copán, the very man who had installed him as ruler, and had him beheaded in his new Acropolis complex. 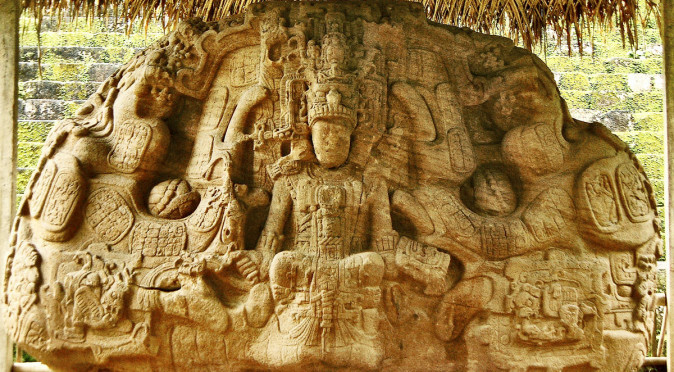 The sacrificial offering of a king was considered to impart great power over the city and its king, and whilst it is more likely that fear and respect were responsible, the sacrifice began a period of great building and expansion as Quiriguá emulated Copán in every respect. The break for independence was almost certainly inspired by Tikal’s great enemy, Calakmul. King Wamaw K’awiil travelled the considerable distance from Calakmul to Quiriguá in 736AD – an event that was surely more than a social visit. This event coincides with the notable increase in building two years previous, and the eventual act of rebellion two years later. The background to these events was the defeat of Tikal to an alliance between the Mayan cities of Caracol and Calakmul in 562AD. However, they didn’t destroy or take over the city and instead left it languishing and oppressed. 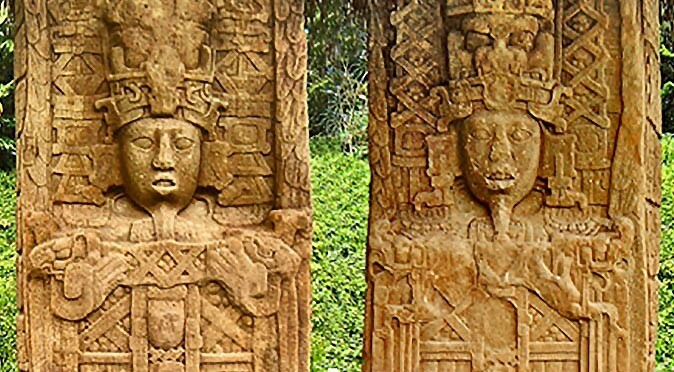 Copán and Quiriguá remained loyal to Tikal throughout this period, which would have left Calakmul no choice but to defeat them directly if they wanted to take control of the lucrative trade route and inflict further misery on their arch-rival, Tikal. It would have been almost impossible to send an army over 200 miles through the treacherous mountains and thick jungles take on the two cities directly, so it seems highly probable that Calakmul chose to pay the smaller vassal city of Quiriguá to attack its master, Copán. Stela E of Cauac SkyThis would have presented an easy way for Calakmul to take control of the rich trade of jade, without having to send its entire army to the remote southern region and leaving themselves exposed to an attack from Tikal. 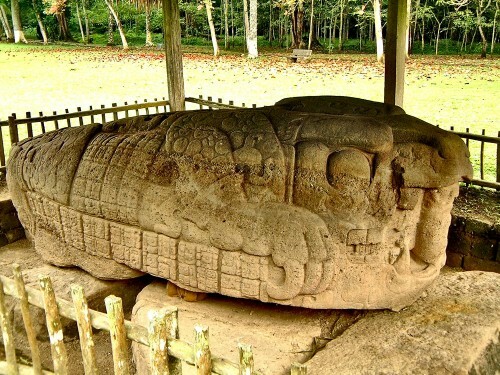 Curiously, there is no evidence of an attack on Copán itself, suggesting that the king was either ambushed whilst preparing to battle with another tribe, or was simply invited to Quiriguá and double-crossed. However, if this had been the case, then there would have almost certainly been a counter-attack or some sort of retribution from Copán. This could be explained if there was a continued threat of a direct attack by superpower Calakmul if Copán didn’t comply peacefully, which adds further weight to idea that Calakmul were sponsoring Quiriguá’s bid for freedom. In fact, far from seeking retribution, it appears the master craftsmen of Copán were relocated to Quiriguá to help Cauac Sky build his new city to the same beautifully crafted standards of Copán. This included the production of some of the finest carved stone Zoomorphs and Stelae that the Maya ever produced. This production possibly reached its zenith in 771AD with the production of the towering Stela E, presumably to commemorate the 52nd anniversary of Cauac Sky’s glorious reign. Standing at 10.6 metres tall and weighing an incredible 65 tons, the Stela is both the tallest monolith ever produced and the largest single block of stone ever quarried by the Maya. 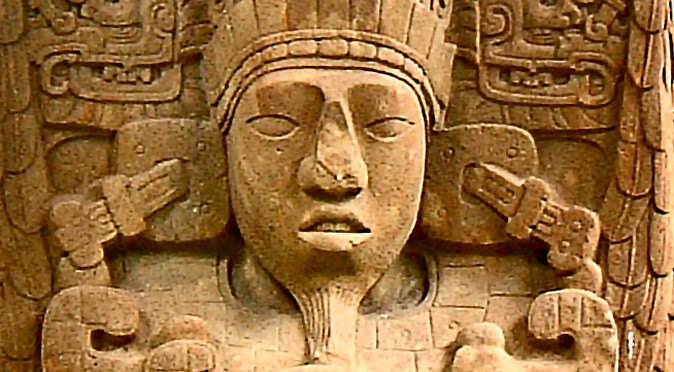 Fig W0994: Zoomorph G Having changed Quiriguá’s destiny for much the better, the great king K’ak’ Tiliw Chan Yopaat (Cauac Sky ) went on to rule until the 27th July 785AD, when he died. The event is commemorated by the beastly Zoomorfo G which was was dedicated on the 4th November 785AD by Cauac Sky’s successor Sky Xul, who was probably his son. His reign was relatively brief, lasting between 10 and 15 years, which may be due to his age upon reaching the throne thanks to Cauac Sky’s incredibly long tenure. Despite the Mayan world collapsing to the north, Sky Xul maintained a healthy programme of building, which includes many of the marvellously ornate zoomorphs and altars found at the site today. 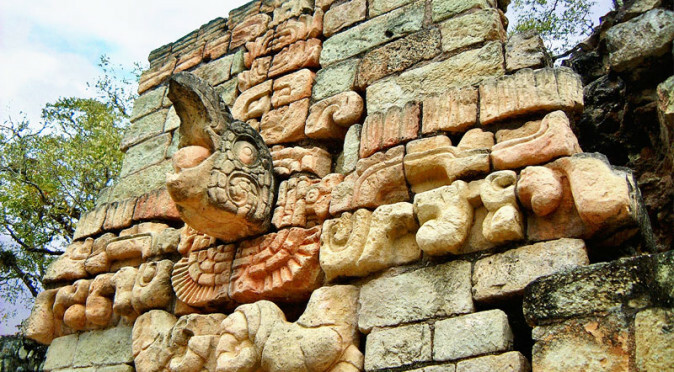 These fine sculptures remain some of the most exquisite Mayan monuments ever found and demonstrate just how rich and powerful this small and unassuming city was, despite its population never exceeding 2,000 people. Sky Xul’s short reign was succeeded in around 805AD by Jade Sky, who managed to continue building around the acropolis area. 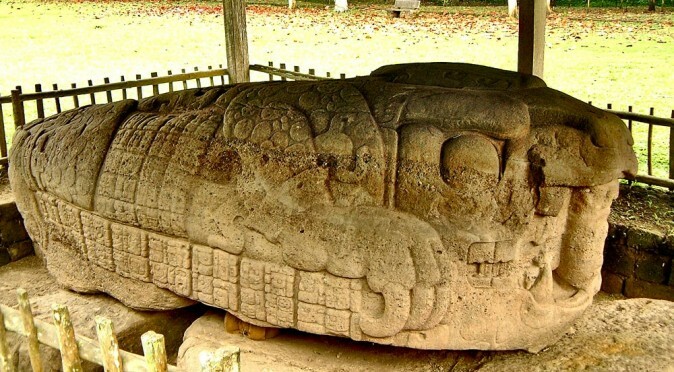 The relationship with Copán seems to have improved by 810AD as Yax Pasaj Chan Yopaat, the ruler of Copán, visited that year to carry out the k’atun-ending ritual to celebrate the completion and commencement of another 7200 day cycle. 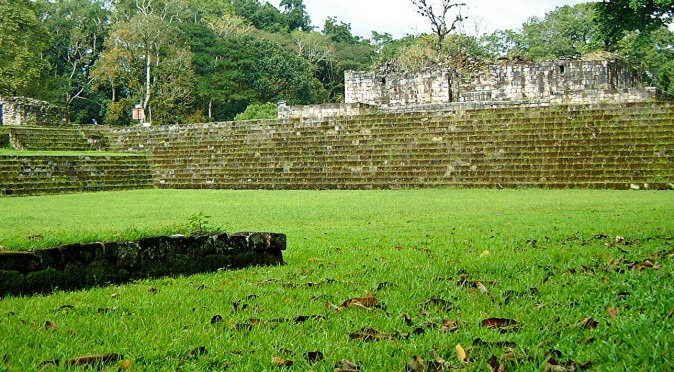 As a city whose importance was based entirely on trade, Quiriguá was never going to escape the decline of the Mayan cities to the north in a period known as the Classic Maya Collapse. Shortly after the last hieroglyphic texts were etched in 810AD the city fell into terminal decline and was abandoned. However it was later reoccupied as the Chontal Maya began trading around the Caribbean Coast and artifacts have been found that evidence trade was taking place between Quiriguá and faraway Chichen Itza. Copper bells and ornaments have also been found dating to this later occupation which are amongst the earliest examples of Mayan metallurgy yet to be found, demonstrating the cities tactical location did span the Mayan collapse. Quirigua takes its name from the nearby village of the same name and was first recorded by a european in 1840, when Frederick Catherwood visited the site and completed two of his world renowned sketches which were later published in his colleague’s book, Incidents of Travel in Central America, Chiapas, and Yucatan, by John Lloyd Stephens. Alfred Maudslay visited the site in 1881, as a result of which he dedicated the rest of his life to Central American archaeology. In 1894, during the last of three visits, he started to clear and survey the site, which included producing the moulds that would be used to create the two copies of beautifully ornate stelae that still stand in the British Museum today.